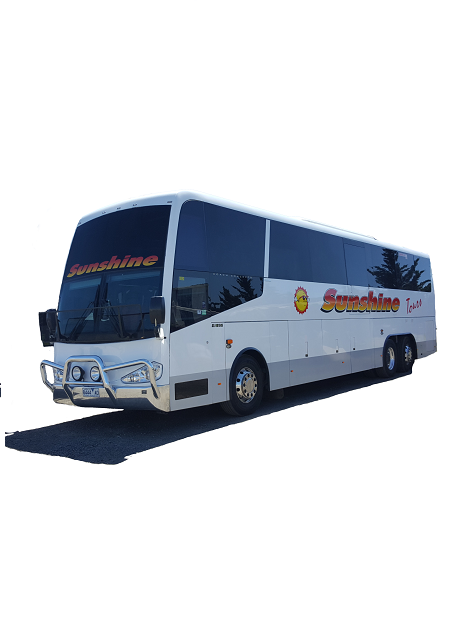 Sunshine Scenic Tours is a progressive Coach and Tour Company with over 22 years of experience.We provide a wide range of high quality services to our customers.Coach Tours, Weekends away, complete packages, as well as school and airport transfers.Our office and depot is based in the western suburbs of Melbourne. On request, we can provide a coach equipped with a built in urn. This 20 litre unit can provide enough boiling water for several cups each. For ease of access, every coach has the ability to kneel to one side, dropping the step down to curb level. Each coach features a minimum of two tv and a maximum of five screens. Giving every passenger throughout the coach a clear view of the action. Passengers are welcome to bring their own CDs on charters. Coaches also have both driver and passenger microphones, enabling the head of the tour to keep their group informed without having to yell. Every seat in every coach has the ability to recline, making it easier to get some shut-eye while we do the driving. Curtains are fitted to every coach. Your comfort and safety is a big priority to us.